Transparency Market Research (TMR) has published a new report titled, ‘Caspofungin Market - Global Industry Analysis, Size, Share, Growth, Trends, and Forecast, 2019–2027.’ According to the report, the global caspofungin market was valued at US$ 496.20 Mn in 2018 and is projected to expand at a CAGR of 0.18% from 2019 to 2027. 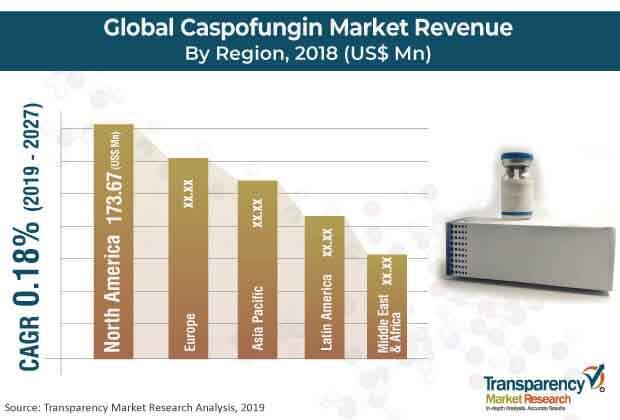 Rise in prevalence of chronic diseases such as cancer and diabetes, increase in the geriatric population, and surge in awareness about advanced therapies are factors anticipated to propel the global caspofungin market from 2019 to 2027. The global population is aging rapidly. According to the WHO, nearly 2 billion people are expected to be aged 60 and above by 2050, accounting for 16.7% of the global population. The population in developed countries such as those in Western Europe, Japan, and the U.S. is aging at a rapid pace. Invasive fungal infections have become an increasing problem in older adults. Opportunistic fungal infections have increased in older patients because they are more likely to receive transplanted solid organs or bone marrow, undergo aggressive treatment of malignancies, and take immunosuppressive medications for dermatologic and rheumatologic diseases. Compared to young patients, older patients are less able to handle invasive endemic or opportunistic infections, and outcomes of infection are frequently worse for elder patients. Increase in the geriatric population is expected to be a major factor likely to augment the global market during the forecast period. The report offers detailed segmentation of the global caspofungin market based on indication, distribution channel, and region. In terms of indication, the candidiasis segment is anticipated to account for large market share due to increase in applications of echinocandins in candidiasis and benefits of echinocandins over other antifungals. The benefits of echinocandins include low risk of drug-drug interactions, novel mechanism of action, and lesser adverse effects. Echinocandins demonstrate compelling activity against Candida species and are the preferred first-line therapy for patients with invasive candidiasis. It has been reported that more than 60% of candidemia patients receive echinocandin during therapy. The hospital pharmacies segment is projected to account for leading share of the global market by 2027. Rise in prevalence of mycosis in the elderly population has increased the number of hospital visits. This in turn is likely to boost the growth of the segment. North America held major share of the global market in terms of revenue in 2018 and is projected to sustain its position during the forecast period. High awareness about latest health care technologies and higher purchasing power are attributed to the larger market share of the region. Favorable reimbursement policies in the region also enable patients to avail the best health care facilities. Europe is anticipated to be the second largest market in terms of share and revenue during the forecast period. Developed health care infrastructure in the region has helped patients undergoing therapies in covering their expenditure. Most health care providers in countries such as Germany, the U.K., and France provide full or partial coverage of costs related to treatment, medication, physicians cost, and tests depending on the patient’s insurance plan and income. The report also provides profiles of leading players operating in the global caspofungin market. These include Teva Pharmaceutical Industries Ltd., Gland Pharma Limited, and Xellia Pharmaceuticals.